Contributor Rlardon created this magnificent drone video compilation from Europe's Pennine Alps. This subrange of the broader Alps system is located in the Valais canton of Switzerland and the Piedmont and Val d'Aosta region of Italy. The Pennine's include some of the most spectacular peaks of Europe, including Monte Rosa (Italy's highest peak) and the famed Matterhorn. The video was shot with a DJI Mavic Pro drone, primarily above Leukerbad, Nendaz and Saas-Fee. 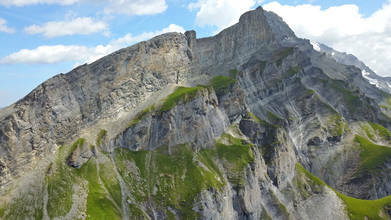 Description: Part four in a compilation of my best shots taken above the Pennine or Valais Alps in Switzerland. All footage was recorded with the DJI Mavic Pro (4K/25fps) and edited in iMovie. This episode was mainly shot above Leukerbad, Nendaz and Saas-Fee, incorporating views of the Gemmipass, the Daubensee, the Rhône valley and some waterfalls in the Saastal. There are also brief glimpses of the Matterhorn, Dent Blanche, Weisshorn, Dom and Mont Blanc massif.